Comprehensive list of recent and historical El Niño / La Niña impacts. El Niño is characterized by unusually warm ocean temperatures in the Equatorial Pacific, as opposed to La Niña, which is characterized by unusually cold ocean temperatures in the Equatorial Pacific. El Niño is an oscillation of the ocean-atmosphere system in the tropical Pacific having important consequences for weather around the globe. Among these consequences are increased rainfall across the southern tier of the US and in Peru, which has caused destructive flooding, and drought in the West Pacific, sometimes associated with devastating brush fires in Australia. Observations of conditions in the tropical Pacific are considered essential for the prediction of short term (a few months to 1 year) climate variations. To provide necessary data, NOAA operates a network of buoys which measure temperature, currents and winds in the equatorial band. These buoys daily transmit data which are available to researchers and forecasters around the world in real time. NOTE: Two of the largest El Niño events on record occurred in 1982-1983 and in 1997-1998. These two important El Niño events are used for illustrations in this web page. In normal, non-El Niño conditions (left, top diagram) the trade winds blow to the west along the equator from South America towards Asia in the tropical Pacific Ocean. These winds pile up warm surface water off Asia, so that the sea surface is about 1/2 meter (1 1/2 feet) higher at Indonesia than at Ecuador in South America. The sea surface temperature is about 8ºC (14ºF) warmer off the coast of Asia than in the eastern Pacific, due to an upwelling of cold water from deeper levels in the east Pacific. The cooler water off South America is nutrient-rich, supporting high levels of primary productivity, diverse marine ecosystems, and major fisheries. Clouds and rainfall are found in rising air over the warmest water near Asia, whereas the east Pacific is relatively dry. In the schematic diagrams to the left, the blue band represents the thermocline, which is the depth of water that is 20ºC (68ºF). During a normal year, it slopes up from Asia towards South America as the trade winds pile up warm water off the coast of Asia. 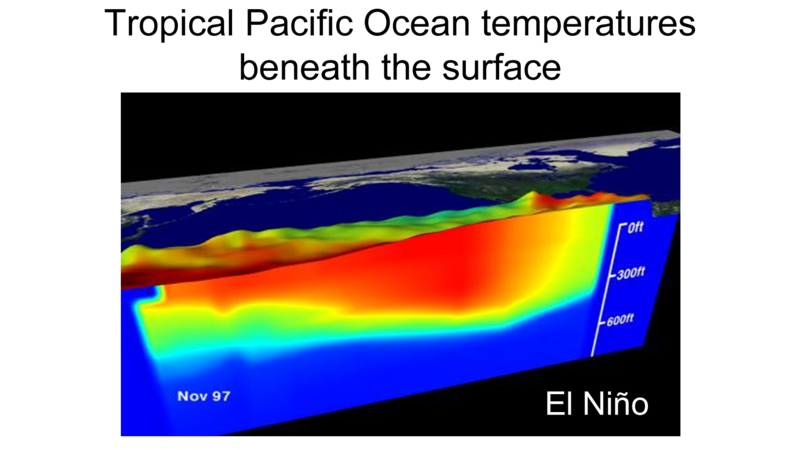 During El Niño (bottom schematic diagram), the trade winds relax in the central and western Pacific leading to a flattening of the thermocline (blue band) due to a depression of the thermocline in the eastern Pacific, and an elevation of the thermocline in the west. The observations at 110ºW show, for example, that during 1982-1983, the 17-degree isotherm dropped to about 150m depth. This reduced the efficiency of upwelling to cool the surface and cut off the supply of nutrient rich thermocline water to the euphotic zone. The result was a rise in sea surface temperature and a drastic decline in primary productivity, the latter of which adversely affected higher trophic levels of the food chain, including commercial fisheries in this region. The weakening of easterly tradewinds during El Niño is evident in this figure as well. Rainfall follows the warm water eastward, with associated flooding in Peru and drought in Indonesia and Australia. The eastward displacement of the atmospheric heat source overlaying the warmest water results in large changes in the global atmospheric circulation, which in turn force changes in weather in regions far removed from the tropical Pacific. El Niño can be seen in measurements of the sea surface temperature, such as those shown in the column to the right, which were made from the TAO Array of moored buoys. Normal conditions: In December 1993 (top figure in column to the right), the sea surface temperatures and the winds were near normal, with warm water in the Western Pacific Ocean (right column of images, red on the top panel of the December 1993 plot), and cool water, called the "cold tongue" in the Eastern Pacific Ocean (right column of images, green on the top panel of the December 1993 plot). The winds in the Western Pacific are very weak (see the arrows pointing in the direction the wind is blowing towards), and the winds in the Eastern Pacific are blowing towards the west (towards Indonesia). The bottom panel of the December 1993 plot shows anomalies, the way the sea surface temperature and wind differs from a normal December. In this plot, the anomalies are very small (yellow/green), indicating a normal December. El Niño conditions: December 1997 (2nd from top in column to the right) was near the peak of a strong El Niño year. In December 1997, the warm water (right column of images, red in the top panel of the December 1997 plot) has spread from the western Pacific Ocean towards the east (in the direction of South America), the "cold tongue" (right column of images, green color in the top panel of the December 1997 plot) has weakened, and the winds in the western Pacific, usually weak, are blowing strongly towards the east, pushing the warm water eastward. The anomalies show clearly that the water in the center of Pacific Ocean is much warmer (red) than in a normal December. La Niña conditions: December 1998 (3nd from top in the column to the right) was a strong La Niña (cold) event. The cold tongue (blue) is cooler than usual by about 3° Centigrade (5.4° Fahrenheit). The cold La Niña events sometimes (but not always) follow El Niño events. El Niño was originally recognized by fisherman off the coast of South America as the appearance of unusually warm water in the Pacific Ocean, occurring near the beginning of the year. El Niño means The Little Boy or Christ child in Spanish. This name was used for the tendency of the phenomenon to arrive around Christmas. There has been a confusing range of uses for the terms El Niño, La Niña, and ENSO by both the scientific community and the general public, which is clarified in this web page on definitions of the terms ENSO, Southern Oscillation Index, El Niño and La Niña. Also interesting is the Web page: Where did the name El Niño come from? Other videos explain how El Niño is predictable, the 2014 "monster" El Niño that never materialized and the 2015-2016 El Niño, which challenges the 1997-1998 El Niño for the largest on record. You can also view a YouTube animation of the evolution of the 2009-2010 El Niño, which shows the strongest "Central Pacific" El Niño in the past 3 decades, with maximum warming in the central equatorial Pacific (vs the classic El Niño, like 1997-1998, with maximum warming in the eastern equatorial Pacific). All of the El Niño animations show the changes in sea surface temperature in the tropical Pacific Ocean, and as you view them, you will see the warm water spreading from the western Pacific to the eastern Pacific as the El Niño evolves. The bottom panel in the animations, labeled anomalies, shows temperature deviations from normal (how much the sea surface temperature is different from the long term average). The red color in the anomalies plot indicates that the temperature of the water is much warmer than is normal for that month, whereas blue color indicates that the water is much cooler than is normal. In the left hand panel of the graphic below, you see the sea surface temperature at the Equator in the Pacific Ocean (Indonesia is towards the left, South America is towards the right). annotated graphic or a larger, realtime version of this graphic (with the latest data). Sea surface temperatures (left panel): The first thing to note is the blue "scallops" on the right of the plot, in the eastern Pacific. These indicate the cool water typically observed in the Eastern Pacific (called the "cold tongue"). Cold tongue temperatures vary seasonally, being warmest in the northern hemisphere springtime and coolest in the northern hemisphere fall. The red color on the left is the warm pool of water typically observed in the western Pacific Ocean. El Niño is an exaggeration of the usual seasonal warm cycle. whereas La Niña is an exaggeration of the usual seasonal cool cycle. During the El Niño in 1986-1987, you can see the warm water (red) penetrating eastward in the Spring of 1987. There is another El Niño in 1991-1992, and you can see the warm water penetrating towards the east in the northern hemisphere spring of 1992. The El Niño in 1997-1998 is a very strong El Niño. El Niño years are easier to see in the anomalies on the right hand panel. The anomalies show how much the sea surface temperature is different from the usual value for each month. Water temperatures significantly warmer than the norm are shown in red, and water temperatures cooler than the norm are shown in blue. Sea surface temperature anomalies or deviations (right panel): It is very easy to see El Niños, with water warmer than usual (red) in the eastern Pacific, during in 1986-1987, 1991-1992, 1993, 1994 and 1997-1998. Notice the very cool water (blue), in the Eastern Pacific, in 1988-1989. This is a strong La Niña, which occurs after some (but not all) El Niño years. 1995-1996 was a weaker La Niña year. It is unusual for El Niños to occur in such rapid succession, as has been the case during 1990-1994. Philander, S.G.H., 1990: El Niño, La Niña and the Southern Oscillation. Academic Press, San Diego, CA, 289 pp. Also see a complete, up-to-date listing of El Niño journal articles. Banner graphic of TAO ocean temperatures from NASA. All other graphics provided by the TAO project office. Winds and temperature from the surface down to 200m deep on the Equator at 110ºW, showing neutral conditions (left) and strong El Nino conditions (right). "Central Pacific" El Niño, 2009-2010. The strongest "Central Pacific El Niño in the past 3 decades, with maximum warming in the central equatorial Pacific, vs the classic El Niño (like 1997-1998), with maximum warming in the eastern equatorial Pacific. See YouTube video.